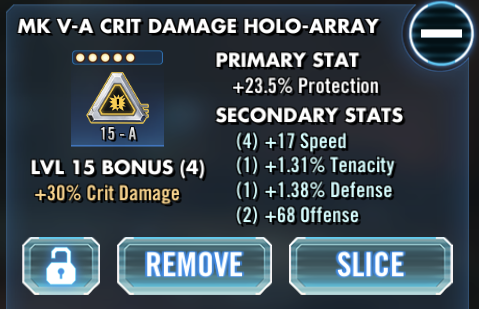 While slicing is available for all 5* mods, the necessary Mod Salvage can take time to acquire and not every mod is an optimal slicing candidate. On average, most players will take 5 – 7 days to slice a single mod to 6E between the time to farm Amplifiers and Capacitors and acquiring Modulators from only the Guild Store. Slicing mods with mediocre stats can be costly and unnecessarily time consuming, so it is important to understand all the considerations involved with determining whether a mod should be sliced. Squares and Diamonds – All Squares have the Offense primary and all Diamonds have the Defense primary. With the large increases from 5A to 6E and with the definite bonuses received from these stats in general, almost all Squares and Diamonds are good candidates for slicing. Circles – Circles have either Health or Protection primares and, with the tiny increase from 23.5% to 24% in Protection %, Health primary Circles are ideal candidates to slice over Protection primary Circles. Arrows – Speed is still the only relevant primary on Arrows, but Tier D-B Arrows with Speed secondaries and non-Speed primaries could be sliced in the hope of gaining higher Speed secondaries. Keep in mind, however, any secondary appearing on an Arrow is easily dwarfed by the Speed primary Arrow. Triangles and Crosses – With the variety of primaries on Triangles and Crosses, it is much more important to consider the mod down to its primary and secondary stats to determine whether Triangles or Crosses will be worth slicing. Offense, Defense, Health, Crit Dam, Crit Chance are all great primaries to slice because they get the largest increases AND also have the best effects. Note: These are good primaries to slice on all but ARROWS. It helps to utilize the above math to determine what the 6E secondary stats will be before slicing a mod from 5A to 6E and compare those secondaries to the max. A “good” stat is around 50% or higher of the available max stats. Before the Mods 2.0 Update, Speed was singularly the only stat that mattered, and while some of the other primaries and secondaries had general value, Speed was overwhelmingly the most useful. The Mods 2.0 Update, however, attempted to level the comparative use of Speed through 6E mods. 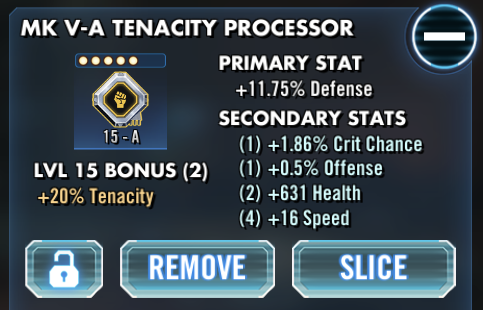 That said, SWGoH is a turn-based game, meaning the character speed will always be the most powerful element. Speed remains as important as ever, but when considering which means mods to slice, Speed as a primary will only go up +2 and Speed as a secondary will only go up +1 (possibly up +2 in extremely rare cases). When all the possibilities are compared, the increases given for Speed are not enough to slice a mod only for Speed. 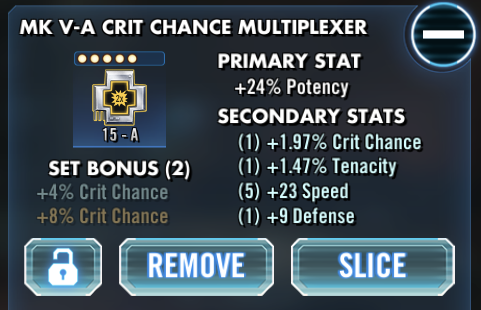 Instead, mods should only be sliced if they already have Speed as a high secondary AND if the other secondary stats are worthwhile as well. There would be an increase 0.5% Protection and three of the four secondaries are all very mediocre. Spending 50 Amplifiers, 50 Capacitors, and 20 Pulse Modulators to achieve some bland secondaries and +1 Speed is not, generally, a good use of resources. Again, all the secondaries are mediocre. That said, the primary will see an increase to 30%. Since +24 Speed is spectacular and very close to the max available, the primary stat and speed increases will justify spending the resources to slice the mod. The Health secondary is moderate, but Crit Chance and Offense are nothing special. That said, the Defense increase from 11.75% to 20% is close to double the Defense given with this mod. In #Understanding Mod Stats it is explained that virtually every character can benefit from Defense. Overall, this would be a decent mod to slice to 6E. Why Do I Need Mod Slicing? How Do I Slice Mods?